Pvt. 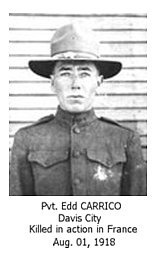 Isaac Edward "Edd" Carrico from Davis City, Iowa, entered the service during World War I, a member of Co. A, 128th Infantry, 32nd Division of the U.S. Army. He was killed in action August 1, 1918, France. Pvt. 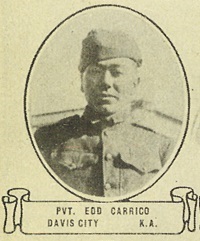 Carrico was interred at Oise-Aisne American Cemetery, Picardie, France.